Amoxicillin is a semi-synthetic antibiotic, an analog of ampicillin. It has broad spectrum bactericidal activity against both gram negative and gram positive strains of microorganisms. It was first discovered by Beecham Research Laboratories and was available in 1972. It is in the World Health Organization’s list of Essential Medicines and was approved by FDA in 1980’s. Amoxicillin is sold under the brand names like Amoxil, Tycil, Trimox, etc. as well as generic is available for this drug. The drug is available in different dosage form i.e tablets, capsules and suspensions and can be taken with or without food. 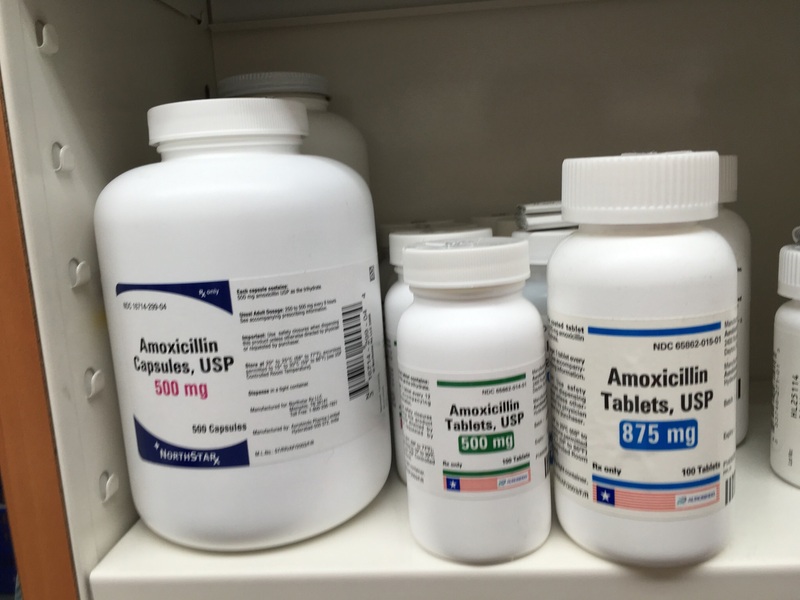 Common dose for the amoxicillin varies with the age group for adult mild to moderate ear, nose or throat infection is 500 mg per 12 hours or 250 mg per 8 hours in divided doses, for severe infections is 850 mg per 12 hours and 500 mg per 8 hours and finish all. For children, in mild to moderate nose, throat or ear is 40 mg per kg at interval of 8 hours and for severe the dose is as high as 48 mg per kg at an interval of 12 hours. In case of overdose immediately call doctor or call 9-1-1. Amoxicillin is a class of Beta-lactam antibiotics which is active against wide range of gram positive and gram negative bacteria. It is a drug of choice within the class because it is well absorbed when orally administered. Amoxicillin is prone to degradation by beta lacatmase enzyme produced by bacteria therefore, to decrease degradation is sometimes given in combination with clavulanic acid. As amoxicillin is an analog of penicillin, it acts by binding to penicillin binding sites called penicillin binding protien 1A(PBP-1A) in the cell wall binding to sensitive part of bacteria making it inactive. This inactivation of the enzyme prevents the cross-linking of two peptidoglycan strands, inhibiting the cell wall synthesis in the body. Further process is mediated with the help of autolysins, this amoxicillin interfers with the autolysins inhibitor. Hypersensitivity: Hypersensitivity is the most common reaction in patients with history of allergy, hay fever , asthma or urticaira. Dermatological: Dermatological side effects majorly include skin rash, fixed dose eruption, and bullous pemphigoid. Gastrointestinal: The side effects that are seen may be even normal malfunctioning of the body but nausea, diarrhea, cramps, vomiting and abdominal pain is also reported. Heamatologic: Patients receiving anticoagulant treatment have been reported with increased bleeding time and decreased hemoglobin and hematocrit. Nervous system: Central system also gets kick from amoxcillin and rarely include headache, dizziness, reversible hyperactivity, agitation, anxiety, insomnia, confusion, convulsions,etc. It is advisable to take amoxicillin in pregnancy but in controlled and prescribed doses as over dose and self medication of antibiotics is not advisable in any conditions. The studies reveals that their are no evidences of teratogenicity in infants after the use of amoxicillin. The benefits of amoxicillin always over weighs the side effects. This antibiotics always come with caution may interfere with birth control pills. The use of amoxicillin is controlled in lactating women, as it is known that amoxicillin is eliminated in the milk. Amoxicillin milk concentration can reach its peak level within 5 hours of intake. The amoxicillin milk concentration may cause sensitization to infants. However, the American Academy of Pediatrics considers it compatible for its use in lactation and breast feeding. This kind of cautions can been seen or read on labels in pharmacy for the medicine and even on the manufactures label, caution use in nursing patient. Absorption: As the drug is administered orally, the absorption is in the range of 40 – 80% from the intestine . Levothyroxine is taken empty stomach for it best efficiency as the dietary fibers may interfere with the absorption of the drug. The absorption is increased by fasting and decreased by certain malabsorption, by certain foods and even age factor plays an important role. Distribution: About 99% of it is bounded to proteins and is circulated in plasma along with thyroxine binding albumin, thyroxine binding globulin and prealbumin. Metabolism: The site of metabolsim is usually liver and kidney. The major pathway for metabolism is sequential deiodination and along with kidney they are responsible for 80% of the circulating T3. It is excreted in bile, from kidney by glucuronidation and conjugation. Elimination: It is majorly eliminated through urine i.e about 80% and remaning T4 is eliminated in stool. Half life elimination is 6-7days for euthyroid patients, about 9-10 days for hypothyroid patients and 3-4 days for hyperthyroid patients. It is not advisable to take medication with coffee but YES, many patients take their medication with coffee or those medication which is mostly prescribed in the morning at breakfast time. Coffee contains caffeine as active ingredient which interferes with the absorption of levothyroxine which was practically performed and published at “Clinical Thyroidology for Patients”. If levothyroxine and coffee are consumed together or taken at same time or slightly after swallowing levothyroxine, it interferes with the proper absorption of levothyroxine or may be called as malabsorption of levothyroxine. This may lead to decrease in the absorption of levothyroxine which is not compensated by the bodies of patients. Dose adjustments is required for effective levothyroxine action in the body. 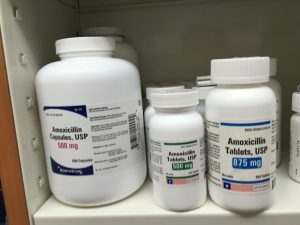 Amoxicillin and Synthroid drug interactions: Yes, you can take levothyroxine and amoxcillin together if prescribed by physician . As physician is the one who knows their profile very keenly and care about patients health. If we talk about the direction of use for levothyroxine and amoxcillin, both are directed to be ingested empty stomach to avoid interaction with food and to avoid decreased efficacy of the drug, to potently resist the infectious bacteria and to with stand the normal function of thyroid hormone replacement therapy. Secondly the two drugs are from different branches of therapy amoxcillin is an antibiotic where as levothyroxine is an aid for hormone replacement therapy.